The AX-8MV Master Station is the centerpiece of the AX Integrated Audio & Video Security system. Each AX-8MV master station can initiate and answer calls from up to 7 additional master stations and up to 8 door or sub stations. The master can be expanded with AX-16SW add-on selectors for a maximum capacity of 120 door / sub stations. Its streamline design is mountable on a wall or desk. 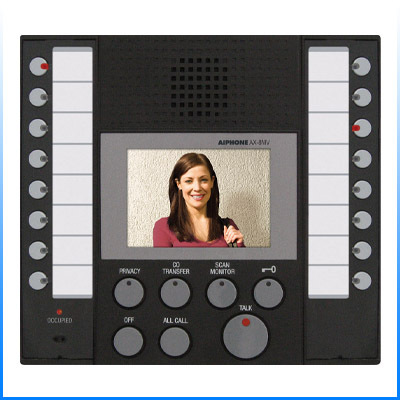 When a video door station calls, a tremolo tone rings and the 3.5" color monitor comes on, displaying the image from the door station location. To answer the call, simply press the TALK button once and speak hands-free, or Press and Hold the TALK button to use as push-to-talk, release-to-listen. If access control is included, simply press the “key” button and the associated electric strike or magnetic lock will be activated. Each master station connects via CAT-5e cable homerun to the AX Central Exchange Unit. Feature and operation variables are set with the system setup software and uploaded to the CEU. White version is available, model AX-8MV-W.